Is the Gospel of Jesus' Wife a fake? Thanks to Chris and Anthony for the opportunity to chat to them about these issues. Christian Askeland on the Gospel of Jesus' Wife: Forgery? "This video attempts to graphically illustrate some peculiarities of the Jesus' Wife Gospel which have persuaded Coptologists that the fragment is in fact a modern forgery. The presentation is targeted to a non-academic audience." The video is about the length of an episode of the NT Pod, so it won't take too much of your time. 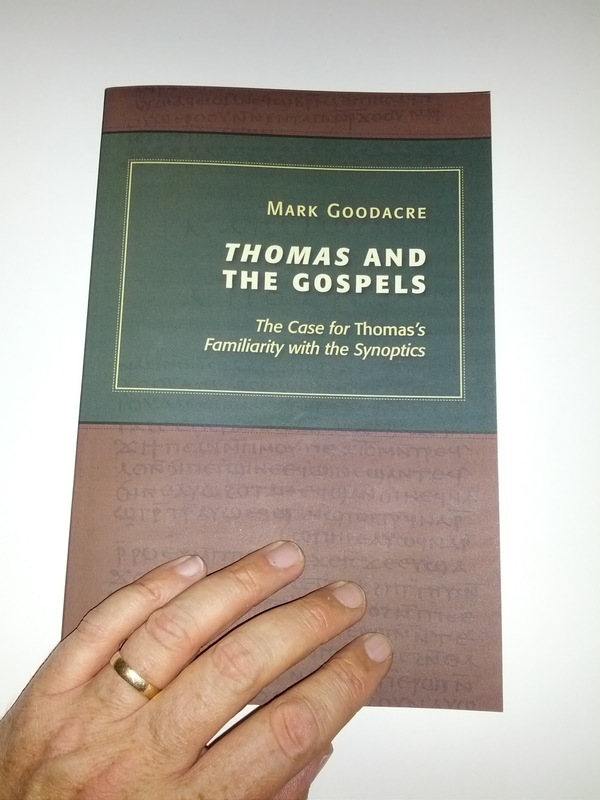 Thanks to Todd Brewer for this pic proving that my Thomas and the Gospels is now out in the UK too! 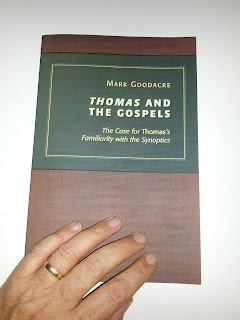 It has a slightly different title in the UK, Thomas and the Gospels: The Making of an Apocryphal Text and a different cover. You can order it from Amazon (previous link) although they are still giving a release date of 18 October. I don't see the book yet on the SPCK website. Meanwhile, if you are looking for the book in the USA, try Eerdmans (where it is now showing up as "in stock") or Amazon (which gives the release date as 24 Sept). Thomas and the Gospels: The Case for Thomas's Familiarity with the Gospels (Grand Rapids: Eerdmans, 2012) arrived today! A Fed Ex man personally brought a nice box full of copies to my office this afternoon. That's my hand in the picture, just to prove that it's real and not just a pic from a catalogue. Many thanks to the folk at Eerdmans who have done such a great job. The British edition, from SPCK, should follow soon. Thanks too to everyone who provided encouragement along the way. As for me, I am not going to look at it now that I can't do anything about the contents. When I was blogging about this last Thursday, just a couple of days after the announcement of the Gospel of Jesus' Wife, I commented that "the story is moving fast!". There has been no change in that pace over the last few days. Francis Watson's three articles on the topic (plus Bible and Interpretation piece) made the papers and convinced many scholars that there is sufficient reason at least to question the authenticity of the fragment. Watson's case is that the fragment is so clearly made up of a patchwork of pieces from our one complete Coptic textual witness of the Gospel of Thomas that scepticism about its antiquity should be the order of the day. The issue of the parallel line break, in the very first line of the fragment, is particularly telling. This is not a case of one text being broadly influenced by another. It is a matter of a fragment that features a patchwork of agreement in Coptic with a specific textual witness of a work probably composed in Greek. This meant that every line, practically every word, of the Jesus Wife Fragment appeared to have a parallel in Coptic Thomas as found in Nag Hammadi Codex II. Could the Gospel of Jesus' Wife be a "Collage" of Words and Phrases Culled Exclusively from the Coptic Gospel of Thomas? Is Jesus' Wife Turning into Thomas? The piece even has a little quotation of me, and has other new material including quotations from Mark Chancey of SMU. At this point, though, there does not seem to be much doubt about the way that the wind is blowing, and there does seem to be sufficient doubt about the authenticity of the piece for most to feel ill at ease with some of the more sanguine assessments that were being made only a week ago. Then this evening it was reported that Harvard Theological Review had "decided against publishing Karen King's paper on the Gospel of Jesus' Wife" (Update on the the Gospel of Jesus' Wife (from Craig Evans), via Brian LePort on Near Emmaus). If this report is indeed accurate, I suspect that this may be a good decision given the questions that have been raised about the fragment over the last week, but of course time will tell whether there will be further twists in the tale. I'd guess that the impact of the Smithsonian Channel's documentary (Youtube clips) will be lessened in the light of the questions over the fragment's authenticity, but I will certainly be watching and hope to live blog it too. It's scheduled for broadcast on Sunday at 8pm and again at 11pm, either side of a documentary about the Titanic. Francis Watson's essay, The Gospel of Jesus' Wife: How a Fake Gospel Fragment was Composed, argues, I think persuasively, that the Gospel fragment that has been at the centre of so much discussion over the last week or so was composed by means of collecting together a patchwork of pieces from the Gospel of Thomas. 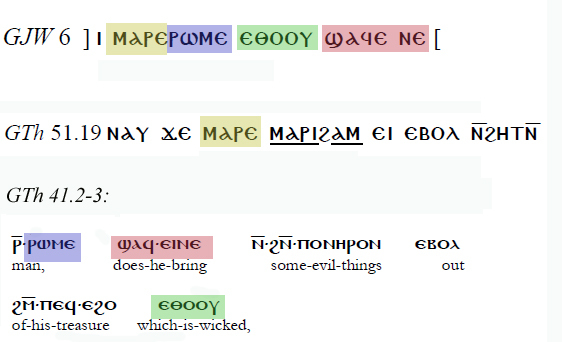 Watson suggested that the last line of the fragment (line 7), however, was taken over not from Thomas but from Matthew. I would like to suggest that in fact this line is also derived from Thomas.
" . I am with her on account of . . . "
"The place which has two or one, I am with him"
Here we have the same three words in Coptic in sequence, ⲁⲛⲟⲕ ϯϣⲟⲟⲡ ⲛⲙⲙⲁ(ϥ / ⲥ), "I am with her / him", with just the switch from male to female. Moreover, even the last word and a bit of the line is found in the same context -- ⲉⲧⲃⲉ ⲡ . . ., "on account of ?" comes twice in Thomas 29, ⲉⲧⲃⲉ ⲡ̅ⲛ̅ⲁ̅, "because of spirit" and ⲉⲧⲃⲉ ⲡⲥⲱⲙⲁ, "because of the body". I would like to suggest, then, that Francis Watson is bang on the money in finding the Gospel of Jesus' Wife to be a patchwork of pieces from the Gospel of Thomas, and to offer this suggestion as extending and so confirming his excellent case. Note: I have used a Coptic unicode font above. If you can't see the Coptic, please see this PDF of the post instead. The essay summarizes the case for non-specialists and goes on to answer several key questions that arise from the analysis. Update (9.49): see now also Watson's Introduction and Summary for non-specialists. The Gospel of Jesus' Wife: The Story is Moving Fast! The internet age really has changed the way that news stories like this develop, for good and for bad. It's only 48 hours since I last had a moment to blog about The Gospel of Jesus' Wife and in that time, the story has developed at a dramatic pace, with news outlets all over the world publishing stories on the find, with scholars attempting to analyze the new find, and the bloggers trying like mad to keep up with everything that is going on. At times like this, I am really grateful for ninja-bloggers like James McGrath, who has updates that scour the blogs for comments, in 2 Jesus' Wife and 3 Jesus' Wife, with lots of links of interest (and he still has time to blog on Doctor Who too -- you've got to admire that), and Jim West who, while outspoken, is often the first to get to a story. (1) There is no doubt that this story is massive. I expected it to get some media coverage and interest when it emerged on Tuesday, but I did not expect the huge amount of interest that it has picked up. It is bigger, I would say, than the James Ossuary in 2003, the Gospel of Judas in 2006 and the Talpiot Tomb in 2007 and 2012. This story, which enables journalists to use "Jesus' wife" in the title of an article, sounds totally compelling. This can be a problem for scholars of early Christianity -- the phone rings, the emails pour in, and everyone wants to know what you think about "Jesus' wife". And getting on top of the scholarship on the fragment in a short time frame can be daunting, especially if you are deep into teaching, meetings and other things. (2) It is becoming clearer all the time that many of the experts doubt the authenticity of the fragment. It seems "too good to be true" -- it fits the Zeitgeist (Jim Davila; see update) and it seems remarkable good fortune that so tiny a fragment now coming to light from a mysterious stranger just happens to talk about Jesus' wife. Since papyrology is not my expertise, I am inclined to defer to the experts on this one, and it is troubling that so few people appear to want to endorse the fragment's authenticity. Christian Askeland's arguments, which incline towards the suggestion that it is a fake, sound persuasive to me (and read the fascinating comments thread). And he's not alone. Stephen Emmel and Alin Suciu have both expressed their Doubts over Harvard claim of 'Jesus' wife' papyrus and I am looking forward to hearing more from them in due course. This is how bad it is at the moment, on day 3: it is difficult to find any expert other than those involved with the publication of the piece who think that it is genuine. (3) I must admit to a little disappointment in finding out tonight, after having praised the careful, sober, scholarly treatment of the release on Tuesday, that there is -- after all -- something of a dramatic, sensational TV documentary at hand. It has clearly been in production for months and Smithsonian are branding it as a "sensational" find of "Biblical proportions" that will cause people to "reassess Christian theology". "She knew that it was a blockbuster." Of course, this kind of thing is simply part of the publicity machine of the channel, but there is something a touch disappointing about finding out that after all, the press releases were timed to coincide with the the pre-publicity for the documentary (which airs on 30 September). I may be being unfair here but I can't help feeling that this takes away from some of what I and others admired about Harvard's handling of the release on Tuesday. (4) It is perhaps not surprising to see Simcha Jacobovici endorsing the new discovery as corroborating his claims about the Talpiot Tombs, which he alleges to have belonged to Jesus, his family, and some of his earliest disciples (Jesus was married. Something has changed!). I doubt that Karen King will be pleased with the endorsement, not least given her repeated caution about the fragment being useless for historical Jesus work. There is certainly lots more to come. I hope to find time to write about the fragment again tomorrow, and in particular to look at how the media misconstrues what scholars mean by "authenticity". Note: Smithsonian are offering a trailer and a sneak preview of the documentary. I've been enjoying the new blog from Chris Keith and Anthony Le Donne. Its focus is on historical Jesus research and it intersects in a timely way with the release of their new co-edited book, Jesus, Criteria and the Demise of Authenticity (London & New York: T & T Clark, 2012). It also acts adds to the sense of anticipation ahead of the associated Conference in Dayton, Ohio in a couple of weeks (4-5 October). There is more, though, than just reflections on the book and the forthcoming conference. There is the first part of an interview with Helen Bond and a top ten on why not to start a blog, which includes the point that "Martin Hengel never blogged". I think that that fact would encourage me to start a blog, but that's just me. This conference will engage Douglas Campbell’s book, "The Deliverance of God" (Eerdmans, 2009). It will summarize and critically discuss his proposals concerning the modern interpretation of Paul’s justification language, argumentation, and resulting version of the gospel. It will cover broader church historical and theological issues, key questions of close exegesis, and the politics of interpretation, especially in the modern American context. Scholars, students, ministers, and interested lay people are all welcome to attend. Speakers include Alan Torrance and Chris Tilling as well as a number of locals including Stephen Chapman, Stanley Hauerwas and Susan Eastman. The Bible in the Public Square conference is now well underway here at Duke and so far it has been an excellent event, with a lively and very stimulating paper last night by Jacques Berlinerblau on the Bible and American presidential politics, continuing this morning with four presentations on the intersection between the Bible and American popular culture by Adele Reinhartz, David Stowe, David Morgan and Rubén R. Dupertuis. These were all excellent but given my interest in the Bible and film, I particularly enjoyed Adele Reinhartz's presentation about the Cecil B. DeMille Ten Commandments. I will continue to live tweet the event with the hashtag #biblepublicsquare. So far, not many others joining in on that one though the events have been well attended. If you weren't aware, you can catch the live stream of the conference on UStream. Just navigate your way to Watch the conference live! on the site's main page. This week's Private Eye (issue 1322, for 7 September 2012) has a feature on The Telegraph's plagiarized obituary of Marvin Meyer (see Plagiarism in the Telegraph's Obituary of Marvin Meyer, exposed here last week). If you are in the UK, the issue is in the shops now and you will find the article on p. 27 under the subheading "Gospel Truth". "Moral of the story," Goodacre tells the Eye: "if you are going to plagiarize, don't do it when writing obituaries of scholars whose work involves source criticism of texts." Many thanks to Richard Bartholomew for sending me a scan of the page. Happy blogiversary to me! The NT Blog is nine years old today. The first blog post, back when it was called the NT Gateway Weblog, was on 2 September 2003. I don't blog quite as often now as I did then, but I still enjoy the blog and hope I'll still be here for the tenth anniversary next year. And it's happy blogiversary also to David Meadows at RogueClassicism whose blog is a few days older than mine. Previous blogiversaries are self-indulgently labelled here. Jim West has put together an excellent round-up of all the blogging posts of interest for the month of August, It’s The August Biblioblog Carnival! The ‘Look, There’s a List of Biblioblog Twitterers’ Edition. The twitterers link isn't working for me at the moment, but otherwise it's all good stuff. Update (22.25): The Bibliobloggers who tweet link is now working again.